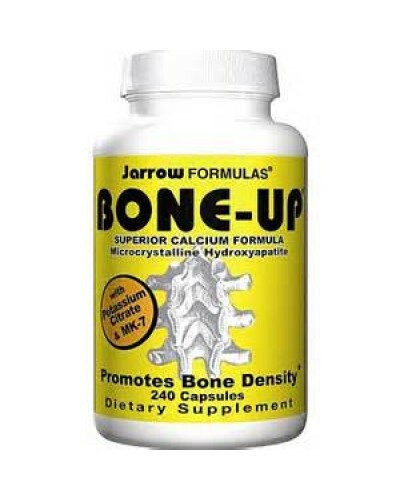 BONE UP 240 CAPS Serving Size: 6 Capsules Servings per Container: 60 Amount Per Serving % Daily Value Vitamin C (as calcium ascorbate) 200 mg 333% Vitamin D3 (cholecalciferol) 1000 IU 250% Natural MK-7 (vitamin K2 as menaquinone-7) 45 mcg 56% Calcium (elemental) (from microcrystalline hydroxyapatite) 1000 mg 100% Magnesium (as magnesium oxide) 500 mg 125% Zinc (as zinc L-monomethionine) 10 mg 67% Copper (as copper gluconate) 1 mg 50% Manganese (as manganese citrate) 1 mg 50% Potassium (as potassium citrate) 99 mg 3% Boron (as boron citrate) 3 mg * *Daily value not established. Other Ingredients: Mangesium stearate (vegetable source) and silicon dioxide. Capsule consists of gelatin. Mineral amounts are elemental. 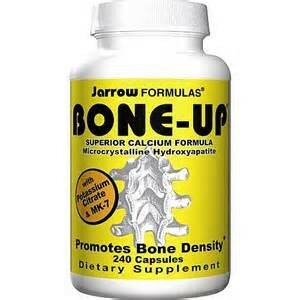 Contains: Soy (in trace amounts).